Good Night Theme for Huawei Mate 9 is a freetheme specially designed for Keyboard users, including dozens ofunified icons and artistic wallpapers, which can personalize yourdevice easily. This theme is for Samsung Galaxy S7, Sony, Huawei,Huawei Mate 9, Motorola, LG, Lenovo, HTC phones and so on. Emoji Keyboard - The NO.1 POP & FREE & COOL Keyboard onGoogle Play. Download Emoji Keyboard for FREE! Download Emoji Keyboard <ahref="https://play.google.com/store/apps/details?id=com.aoemoji.keyboard”>FREEEmoji</a> supports 60+ languages ,4000+emojis and Morethemes.<br><br>Emoji keyboard is Google Play supportthe most expression of the largest emoji, over more than 4000+Emoji for your choice. Support more than 60+ languages，over freeKeyboard theme!<br><br>-New Version: DIY themesfunction allows you to become a designer yourself and turns yourcreative ideas into unique themes right on yourphone!<br><br><b> ★ Features:★</b><br>🍏-Over more than 4000+ colorful & cuteemojis, emoticons and smileys for free.<br>🐻-Emoji Style:Android Robot(Black&White), Facebook, Android 7.0 Emoji,WhatApp's skin tone emoji.<br>🐼- Works for all applications,input emoji in Facebook Messenger\ WhatsApp\ Google Allo \Google+\Wechat \ Line etc.<br>🐯 -Support all fancy emoji KeyboardThemes.<br>🐨- Sliding input, Gesture typing,Word suggestions,Contacts dictionary..<br>🦁- More than 60+ languageskeyboard.<br>⚽️- Perfect fit for Android devices includingpad and phone.<br>🚕- NO Ads and MORE FREE toenjoy.<br><br>💬FAQ<br>❗️ How to Apply theTheme:<br>1. Download and install the theme;<br>2.Install the safest & fastest keyboard - EmojiKeyboard;<br>3. Start Emoji Keyboard and then you can applythe theme you downloaded.<br>If you already have EmojiKeyboard on your phone, you can also directly open the theme andenable it to your phone.<br>It is a photo Keyboard inEmoji.<br><br>The Emoji Keyboard makes a perfect toolthat learns your typing patterns then predicts and corrects yourtyping- as you type.<br><br>Try it out now forFREE!<br><br>⭐️⭐️⭐️Please rate our Good Night EmojiKeyboard on Google Play if you liked it! (-:⭐️⭐️⭐️<br><br>Please leave a feedback on our email([email protected]) in case of any problems with thisBeautiful theme. Keyboard Theme for Windows 10 for Huawei Mate9 is a free theme specially designed for Keyboard users, includingdozens of unified icons and artistic wallpapers, which canpersonalize your device easily. This theme is for Samsung GalaxyS7, Sony, Huawei, Huawei Mate 9, Motorola, LG, Lenovo, HTC phonesand so on.Emoji Keyboard - The NO.1 POP & FREE & COOL Keyboard onGoogle Play. Download Emoji Keyboard for FREE!Download Emoji Keyboard <ahref="https://play.google.com/store/apps/details?id=com.aoemoji.keyboard”>FREEEmoji</a> supports 60+ languages ,4000+emojis and Morethemes.<br><br>Emoji keyboard is Google Play supportthe most expression of the largest emoji, over more than 4000+Emoji for your choice. Support more than 60+ languages，over freeKeyboard theme!<br><br>-New Version: DIY themesfunction allows you to become a designer yourself and turns yourcreative ideas into unique themes right on yourphone!<br><br><b> ★ Features:★</b><br>🍏-Over more than 4000+ colorful & cuteemojis, emoticons and smileys for free.<br>🐻-Emoji Style:Android Robot(Black&White), Facebook, Android 7.0 Emoji,WhatApp's skin tone emoji.<br>🐼- Works for all applications,input emoji in Facebook Messenger\ WhatsApp\ Google Allo \Google+\Wechat \ Line etc.<br>🐯 -Support all fancy emoji KeyboardThemes.<br>🐨- Sliding input, Gesture typing,Word suggestions,Contacts dictionary..<br>🦁- More than 60+ languageskeyboard.<br>⚽️- Perfect fit for Android devices includingpad and phone.<br>🚕- NO Ads and MORE FREE toenjoy.<br><br>💬FAQ<br>❗️ How to Apply theTheme:<br>1. Download and install the theme;<br>2.Install the safest & fastest keyboard - EmojiKeyboard;<br>3. Start Emoji Keyboard and then you can applythe theme you downloaded.<br>If you already have EmojiKeyboard on your phone, you can also directly open the theme andenable it to your phone.<br>It is a photo Keyboard inEmoji.<br><br>The Emoji Keyboard makes a perfect toolthat learns your typing patterns then predicts and corrects yourtyping- as you type.<br><br>Try it out now forFREE!<br><br>⭐️⭐️⭐️Please rate our Windows 10 theme onGoogle Play if you liked it! (-: ⭐️⭐️⭐️<br><br>Pleaseleave a feedback on our email ([email protected]) in case ofany problems with this Beautiful theme. White Theme is a free theme specially designedfor Keyboard users, including dozens of unified icons and artisticwallpapers, which can personalize your device easily. This theme isfor Samsung Galaxy S7, Sony, Huawei, Huawei Mate 9, Motorola, LG,Lenovo, HTC phones and so on.Emoji Keyboard - The NO.1 POP & FREE & COOL Keyboard onGoogle Play. Download Emoji Keyboard for FREE!Download Emoji Keyboard <ahref="https://play.google.com/store/apps/details?id=com.aoemoji.keyboard”>FREEEmoji</a> supports 60+ languages ,4000+emojis and Morethemes.<br><br>Emoji keyboard is Google Play supportthe most expression of the largest emoji, over more than 4000+Emoji for your choice. Support more than 60+ languages，over freeKeyboard theme!<br><br>-New Version: DIY themesfunction allows you to become a designer yourself and turns yourcreative ideas into unique themes right on yourphone!<br><br><b> ★ Features:★</b><br>🍏-Over more than 4000+ colorful & cuteemojis, emoticons and smileys for free.<br>🐻-Emoji Style:Android Robot(Black&White), Facebook, Android 7.0 Emoji,WhatApp's skin tone emoji.<br>🐼- Works for all applications,input emoji in Facebook Messenger\ WhatsApp\ Google Allo \Google+\Wechat \ Line etc.<br>🐯 -Support all fancy emoji KeyboardThemes.<br>🐨- Sliding input, Gesture typing,Word suggestions,Contacts dictionary..<br>🦁- More than 60+ languageskeyboard.<br>⚽️- Perfect fit for Android devices includingpad and phone.<br>🚕- NO Ads and MORE FREE toenjoy.<br><br>💬FAQ<br>❗️ How to Apply theTheme:<br>1. Download and install the theme;<br>2.Install the safest & fastest keyboard - EmojiKeyboard;<br>3. Start Emoji Keyboard and then you can applythe theme you downloaded.<br>If you already have EmojiKeyboard on your phone, you can also directly open the theme andenable it to your phone.<br>It is a photo Keyboard inEmoji.<br><br>The Emoji Keyboard makes a perfect toolthat learns your typing patterns then predicts and corrects yourtyping- as you type.<br><br>Try it out now forFREE!<br><br>⭐️⭐️⭐️Please rate our White Theme onGoogle Play if you liked it! (-: ⭐️⭐️⭐️<br><br>Pleaseleave a feedback on our email ([email protected]) in case ofany problems with this Beautiful theme. Black Pink Keyboard Theme for Huawei Mate 9 isa free theme specially designed for Keyboard users, includingdozens of unified icons and artistic wallpapers, which canpersonalize your device easily. This theme is for Samsung GalaxyS7, Sony, Huawei, Huawei Mate 9, Motorola, LG, Lenovo, HTC phonesand so on.Emoji Keyboard - The NO.1 POP & FREE & COOL Keyboard onGoogle Play. Download Emoji Keyboard for FREE!Download Emoji Keyboard <ahref="https://play.google.com/store/apps/details?id=com.aoemoji.keyboard”>FREEEmoji</a> supports 60+ languages ,4000+emojis and Morethemes.<br><br>Emoji keyboard is Google Play supportthe most expression of the largest emoji, over more than 4000+Emoji for your choice. Support more than 60+ languages，over freeKeyboard theme!<br><br>-New Version: DIY themesfunction allows you to become a designer yourself and turns yourcreative ideas into unique themes right on yourphone!<br><br><b> ★ Features:★</b><br>🍏-Over more than 4000+ colorful & cuteemojis, emoticons and smileys for free.<br>🐻-Emoji Style:Android Robot(Black&White), Facebook, Android 7.0 Emoji,WhatApp's skin tone emoji.<br>🐼- Works for all applications,input emoji in Facebook Messenger\ WhatsApp\ Google Allo \Google+\Wechat \ Line etc.<br>🐯 -Support all fancy emoji KeyboardThemes.<br>🐨- Sliding input, Gesture typing,Word suggestions,Contacts dictionary..<br>🦁- More than 60+ languageskeyboard.<br>⚽️- Perfect fit for Android devices includingpad and phone.<br>🚕- NO Ads and MORE FREE toenjoy.<br><br>💬FAQ<br>❗️ How to Apply theTheme:<br>1. Download and install the theme;<br>2.Install the safest & fastest keyboard - EmojiKeyboard;<br>3. Start Emoji Keyboard and then you can applythe theme you downloaded.<br>If you already have EmojiKeyboard on your phone, you can also directly open the theme andenable it to your phone.<br>It is a photo Keyboard inEmoji.<br><br>The Emoji Keyboard makes a perfect toolthat learns your typing patterns then predicts and corrects yourtyping- as you type.<br><br>Try it out now forFREE!<br><br>⭐️⭐️⭐️Please rate our Black Pink KeyboardTheme on Google Play if you liked it! (-:⭐️⭐️⭐️<br><br>Please leave a feedback on our email([email protected]) in case of any problems with thisBeautiful theme. Black Night for Huawei Mate 9 is a free themespecially designed for Keyboard users, including dozens of unifiedicons and artistic wallpapers, which can personalize your deviceeasily. This theme is for Samsung Galaxy S7, Sony, Huawei, HuaweiMate 9, Motorola, LG, Lenovo, HTC phones and so on.Emoji Keyboard - The NO.1 POP & FREE & COOL Keyboard onGoogle Play. Download Emoji Keyboard for FREE!Download Emoji Keyboard <ahref="https://play.google.com/store/apps/details?id=com.aoemoji.keyboard”>FREEEmoji</a> supports 60+ languages ,4000+emojis and Morethemes.<br><br>Emoji keyboard is Google Play supportthe most expression of the largest emoji, over more than 4000+Emoji for your choice. Support more than 60+ languages，over freeKeyboard theme!<br><br>-New Version: DIY themesfunction allows you to become a designer yourself and turns yourcreative ideas into unique themes right on yourphone!<br><br><b> ★ Features:★</b><br>🍏-Over more than 4000+ colorful & cuteemojis, emoticons and smileys for free.<br>🐻-Emoji Style:Android Robot(Black&White), Facebook, Android 7.0 Emoji,WhatApp's skin tone emoji.<br>🐼- Works for all applications,input emoji in Facebook Messenger\ WhatsApp\ Google Allo \Google+\Wechat \ Line etc.<br>🐯 -Support all fancy emoji KeyboardThemes.<br>🐨- Sliding input, Gesture typing,Word suggestions,Contacts dictionary..<br>🦁- More than 60+ languageskeyboard.<br>⚽️- Perfect fit for Android devices includingpad and phone.<br>🚕- NO Ads and MORE FREE toenjoy.<br><br>💬FAQ<br>❗️ How to Apply theTheme:<br>1. Download and install the theme;<br>2.Install the safest & fastest keyboard - EmojiKeyboard;<br>3. Start Emoji Keyboard and then you can applythe theme you downloaded.<br>If you already have EmojiKeyboard on your phone, you can also directly open the theme andenable it to your phone.<br>It is a photo Keyboard inEmoji.<br><br>The Emoji Keyboard makes a perfect toolthat learns your typing patterns then predicts and corrects yourtyping- as you type.<br><br>Try it out now forFREE!<br><br>⭐️⭐️⭐️Please rate our Black Night theme onGoogle Play if you liked it! (-: ⭐️⭐️⭐️<br><br>Pleaseleave a feedback on our email ([email protected]) in case ofany problems with this Beautiful theme. Neon Theme for Huawei Mate 9 is a free themespecially designed for Keyboard users, including dozens of unifiedicons and artistic wallpapers, which can personalize your deviceeasily. This theme is for Samsung Galaxy S7, Sony, Huawei, HuaweiMate 9, Motorola, LG, Lenovo, HTC phones and so on.Emoji Keyboard - The NO.1 POP & FREE & COOL Keyboard onGoogle Play. Download Emoji Keyboard for FREE!Download Emoji Keyboard <ahref="https://play.google.com/store/apps/details?id=com.aoemoji.keyboard”>FREEEmoji</a> supports 60+ languages ,4000+emojis and Morethemes.<br><br>Emoji keyboard is Google Play supportthe most expression of the largest emoji, over more than 4000+Emoji for your choice. Support more than 60+ languages，over freeKeyboard theme!<br><br>-New Version: DIY themesfunction allows you to become a designer yourself and turns yourcreative ideas into unique themes right on yourphone!<br><br><b> ★ Features:★</b><br>🍏-Over more than 4000+ colorful & cuteemojis, emoticons and smileys for free.<br>🐻-Emoji Style:Android Robot(Black&White), Facebook, Android 7.0 Emoji,WhatApp's skin tone emoji.<br>🐼- Works for all applications,input emoji in Facebook Messenger\ WhatsApp\ Google Allo \Google+\Wechat \ Line etc.<br>🐯 -Support all fancy emoji KeyboardThemes.<br>🐨- Sliding input, Gesture typing,Word suggestions,Contacts dictionary..<br>🦁- More than 60+ languageskeyboard.<br>⚽️- Perfect fit for Android devices includingpad and phone.<br>🚕- NO Ads and MORE FREE toenjoy.<br><br>💬FAQ<br>❗️ How to Apply theTheme:<br>1. Download and install the theme;<br>2.Install the safest & fastest keyboard - EmojiKeyboard;<br>3. Start Emoji Keyboard and then you can applythe theme you downloaded.<br>If you already have EmojiKeyboard on your phone, you can also directly open the theme andenable it to your phone.<br>It is a photo Keyboard inEmoji.<br><br>The Emoji Keyboard makes a perfect toolthat learns your typing patterns then predicts and corrects yourtyping- as you type.<br><br>Try it out now forFREE!<br><br>⭐️⭐️⭐️Please rate our neon theme on GooglePlay if you liked it! (-: ⭐️⭐️⭐️<br><br>Please leave afeedback on our email ([email protected]) in case of anyproblems with this Beautiful theme. Simple Emoji Keyboard Theme for Huawei Mate 9is a free theme specially designed for Keyboard users, includingdozens of unified icons and artistic wallpapers, which canpersonalize your device easily. This theme is for Samsung GalaxyS7, Sony, Huawei, Huawei Mate 9, Motorola, LG, Lenovo, HTC phonesand so on.Emoji Keyboard - The NO.1 POP & FREE & COOL Keyboard onGoogle Play. Download Emoji Keyboard for FREE!Download Emoji Keyboard <ahref="https://play.google.com/store/apps/details?id=com.aoemoji.keyboard”>FREEEmoji</a> supports 60+ languages ,4000+emojis and Morethemes.<br><br>Emoji keyboard is Google Play supportthe most expression of the largest emoji, over more than 4000+Emoji for your choice. Support more than 60+ languages，over freeKeyboard theme!<br><br>-New Version: DIY themesfunction allows you to become a designer yourself and turns yourcreative ideas into unique themes right on yourphone!<br><br><b> ★ Features:★</b><br>🍏-Over more than 4000+ colorful & cuteemojis, emoticons and smileys for free.<br>🐻-Emoji Style:Android Robot(Black&White), Facebook, Android 7.0 Emoji,WhatApp's skin tone emoji.<br>🐼- Works for all applications,input emoji in Facebook Messenger\ WhatsApp\ Google Allo \Google+\Wechat \ Line etc.<br>🐯 -Support all fancy emoji KeyboardThemes.<br>🐨- Sliding input, Gesture typing,Word suggestions,Contacts dictionary..<br>🦁- More than 60+ languageskeyboard.<br>⚽️- Perfect fit for Android devices includingpad and phone.<br>🚕- NO Ads and MORE FREE toenjoy.<br><br>💬FAQ<br>❗️ How to Apply theTheme:<br>1. Download and install the theme;<br>2.Install the safest & fastest keyboard - EmojiKeyboard;<br>3. Start Emoji Keyboard and then you can applythe theme you downloaded.<br>If you already have EmojiKeyboard on your phone, you can also directly open the theme andenable it to your phone.<br>It is a photo Keyboard inEmoji.<br><br>The Emoji Keyboard makes a perfect toolthat learns your typing patterns then predicts and corrects yourtyping- as you type.<br><br>Try it out now forFREE!<br><br>⭐️⭐️⭐️Please rate our Simple EmojiKeyboard Theme on Google Play if you liked it! (-:⭐️⭐️⭐️<br><br>Please leave a feedback on our email([email protected]) in case of any problems with thisBeautiful theme. GingerBread Theme for Huawei Mate 9 is a freetheme specially designed for Keyboard users, including dozens ofunified icons and artistic wallpapers, which can personalize yourdevice easily. This theme is for Samsung Galaxy S7, Sony, Huawei,Huawei Mate 9, Motorola, LG, Lenovo, HTC phones and so on.Emoji Keyboard - The NO.1 POP & FREE & COOL Keyboard onGoogle Play. Download Emoji Keyboard for FREE!Download Emoji Keyboard <ahref="https://play.google.com/store/apps/details?id=com.aoemoji.keyboard”>FREEEmoji</a> supports 60+ languages ,4000+emojis and Morethemes.<br><br>Emoji keyboard is Google Play supportthe most expression of the largest emoji, over more than 4000+Emoji for your choice. Support more than 60+ languages，over freeKeyboard theme!<br><br>-New Version: DIY themesfunction allows you to become a designer yourself and turns yourcreative ideas into unique themes right on yourphone!<br><br><b> ★ Features:★</b><br>🍏-Over more than 4000+ colorful & cuteemojis, emoticons and smileys for free.<br>🐻-Emoji Style:Android Robot(Black&White), Facebook, Android 7.0 Emoji,WhatApp's skin tone emoji.<br>🐼- Works for all applications,input emoji in Facebook Messenger\ WhatsApp\ Google Allo \Google+\Wechat \ Line etc.<br>🐯 -Support all fancy emoji KeyboardThemes.<br>🐨- Sliding input, Gesture typing,Word suggestions,Contacts dictionary..<br>🦁- More than 60+ languageskeyboard.<br>⚽️- Perfect fit for Android devices includingpad and phone.<br>🚕- NO Ads and MORE FREE toenjoy.<br><br>💬FAQ<br>❗️ How to Apply theTheme:<br>1. Download and install the theme;<br>2.Install the safest & fastest keyboard - EmojiKeyboard;<br>3. Start Emoji Keyboard and then you can applythe theme you downloaded.<br>If you already have EmojiKeyboard on your phone, you can also directly open the theme andenable it to your phone.<br>It is a photo Keyboard inEmoji.<br><br>The Emoji Keyboard makes a perfect toolthat learns your typing patterns then predicts and corrects yourtyping- as you type.<br><br>Try it out now forFREE!<br><br>⭐️⭐️⭐️Please rate our GingerBread theme onGoogle Play if you liked it! (-: ⭐️⭐️⭐️<br><br>Pleaseleave a feedback on our email ([email protected]) in case ofany problems with this Beautiful theme. Pink Emoji Keyboard Theme for Huawei Mate 9 isa free theme specially designed for Keyboard users, includingdozens of unified icons and artistic wallpapers, which canpersonalize your device easily. This theme is for Samsung GalaxyS7, Sony, Huawei, Huawei Mate 9, Motorola, LG, Lenovo, HTC phonesand so on.Emoji Keyboard - The NO.1 POP & FREE & COOL Keyboard onGoogle Play. Download Emoji Keyboard for FREE!Download Emoji Keyboard <ahref="https://play.google.com/store/apps/details?id=com.aoemoji.keyboard”>FREEEmoji</a> supports 60+ languages ,4000+emojis and Morethemes.<br><br>Emoji keyboard is Google Play supportthe most expression of the largest emoji, over more than 4000+Emoji for your choice. Support more than 60+ languages，over freeKeyboard theme!<br><br>-New Version: DIY themesfunction allows you to become a designer yourself and turns yourcreative ideas into unique themes right on yourphone!<br><br><b> ★ Features:★</b><br>🍏-Over more than 4000+ colorful & cuteemojis, emoticons and smileys for free.<br>🐻-Emoji Style:Android Robot(Black&White), Facebook, Android 7.0 Emoji,WhatApp's skin tone emoji.<br>🐼- Works for all applications,input emoji in Facebook Messenger\ WhatsApp\ Google Allo \Google+\Wechat \ Line etc.<br>🐯 -Support all fancy emoji KeyboardThemes.<br>🐨- Sliding input, Gesture typing,Word suggestions,Contacts dictionary..<br>🦁- More than 60+ languageskeyboard.<br>⚽️- Perfect fit for Android devices includingpad and phone.<br>🚕- NO Ads and MORE FREE toenjoy.<br><br>💬FAQ<br>❗️ How to Apply theTheme:<br>1. Download and install the theme;<br>2.Install the safest & fastest keyboard - EmojiKeyboard;<br>3. Start Emoji Keyboard and then you can applythe theme you downloaded.<br>If you already have EmojiKeyboard on your phone, you can also directly open the theme andenable it to your phone.<br>It is a photo Keyboard inEmoji.<br><br>The Emoji Keyboard makes a perfect toolthat learns your typing patterns then predicts and corrects yourtyping- as you type.<br><br>Try it out now forFREE!<br><br>⭐️⭐️⭐️Please rate our pink theme on GooglePlay if you liked it! (-: ⭐️⭐️⭐️<br><br>Please leave afeedback on our email ([email protected]) in case of anyproblems with this Beautiful theme. We have something new for your HTC One smartphone: Keyboard For HTCOne! Download our latest keyboard now and enjoy the modern shadesof violet on your smartphone!★★★ The new Keyboard For HTC One willchange the background of your keyboard with a unique design andamazing color. With keyboard themes for Android you can personalizethe smartphone keyboard. Try one design and see how new keyboardthemes can transform your phone!★★★★★★You can see how this themelooks in the HD screenshots we added. This is one of the keyboardthemes for Android that is compatible with most smartphone versionsand will look amazing on your Android device.★★★✧ Give yourstandard keyboard a new look ! This keyboard theme will change thelook and shape of the keyboard buttons, so now it is easier towrite.✧✧ Get this keyboard theme and start using it instantly!Installation is easy and the steps to activate the keyboard arevery easy!✧★★★ How to install and use Keyboard For HTC One★★★• Makesure you have GO Keyboard - Emoji, Wallpaper or New 2018 Keyboardinstalled on your Android phone or tablet.• Download Keyboard ForHTC One • Open the new keyboard theme and select "Set as ActiveTheme"• Start using the new free keyboard theme!★ Notice ★ If youdo not have GO Keyboard - Emoji, Wallpaper or New 2018 Keyboardinstalled yet, not to worry, you will be redirected to a downloadpage where you can install the compatible keyboard!✧ Do you wantmore themes for keyboard?✧ Visit our developer page and downloadmore free keyboard themes!◆ Contact [email protected] if you have any theme requests! We’realways looking to publish amazing new free keyboard themes forAndroid! Stay connected with us on social media and you will findout when we publish new themes for keyboard. Change the default theme for Samsung Galaxy S9, your new Androiddevice with the amazing CM 14 Theme For Samsung Galaxy S9. A themedesigned by some creative and amazingly talented artists.The iconsand other visual elements will certainly enhance the amazing lookof your new launcher screen. ★ What would you get if you install CM14 and download Theme For Samsung Galaxy S9 ★ If you want todownload this Launcher for Android, you can: • Change the galaxy S9theme this amazing launcher theme design and fantastic colors willlook amazing on your android phone. • Customized theme and iconpacks and change them all on your galaxy S9 phone to match youpreferred style; • Have great visual effects compatible to all yourdevices with this amazing galaxy S9 themes and HD Launcher; •Change the galaxy S9 theme font and color when you install thisfree theme launcher 2018. ★ Download & Install this amazingLauncher theme for free ★ • Download Theme For Samsung Galaxy S9. •Open this amazing new launcher theme for android and enjoy coollauncher theme experience. • You'll be notified if this galaxy S9theme for free is not compatible with your android device. • Afteryou install free theme for galaxy S9, which is designed as anamazing customized theme. ◆ Personalization ◆ This android app letsyou download CM 14 Themes For Samsung Galaxy S9 which is an amazingfree theme and Launcher 2018 for Android, we have designed it forgreat compatibility with your galaxy S9 to work perfectly. This isan amazing theme for new Launcher that works perfectly with thebest compatible Launcher apps 2018. If you do not have a compatibleapp android device, You'll be notified if this galaxy S9 theme forfree is not compatible with your android device. ★ Install andDownload awesome Launchers for Android! ★ ★ Visit our developerpage to install and download these amazing free themes for galaxyS9 android phone. ★ Hundreds of amazing apps designed for newLaunchers theme with CM14! ★ Please rate and review if you enjoythese amazing themes for galaxy S9 with CM 14! ★ CM 14 Theme ForSamsung Galaxy S9 are designed to give you unique and customizedpersonalization option for galaxy S9 android phone! ★ CM 14 ThemeFor Samsung Galaxy S9 will become your favorite Android app foryour phone or tablet with this new amazing Launcher 2018. ♥FeaturedCategory ♥ Theme for CM 14 theme engine base on Galaxy S9 2017 NewVersion style. Theme - Galaxy S9 CM14 2018 New Version. - Galaxy S9icons - Galaxy S9 control components. - Quick settings with GalaxyS9 style - Setting with Galaxy S9 style - Keyboard with Galaxy Note8 S8 style - Dialer and Contact with Galaxy Note 8 S8 style Themedpackages: - SystemUI - Settings - Dialer - Email - Contact - SMS -Phone - Browser - Gallery - Vending * Note : This theme is onlycompatible with CM. Please reboot your phone after apply the theme.Hope you enjoy it. Who doesn’t like the combination between these beautiful shades ofblue and purple? They look so calm and innocent. This keyboardtheme will be perfect for you if you want something that will calmand make you daily dream. Our dream team created Keyboard Theme ForHTC and gave it a calm mood. You can enjoy those pastel colorskeyboard themes for android free on your device now! DownloadKeyboard Theme For HTC and start enjoying the new experience youwill get when you will type. If you are convinced about thisperfect keyboard, share it with others also. ★★★ The new KeyboardTheme For HTC will change the background of your keyboard with aunique design and amazing color. 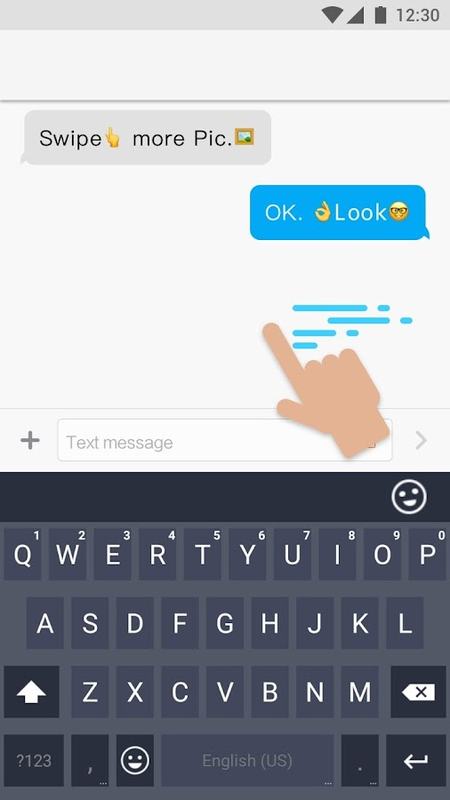 With keyboard themes for Androidyou can personalize the smartphone keyboard. Try one design and seehow new keyboard themes can transform your phone!★★★★★★You can seehow this theme looks in the HD screenshots we added. This is one ofthe keyboard themes for Android that is compatible with mostsmartphone versions and will look amazing on your Androiddevice.★★★✧ Give your standard keyboard a new look ! This keyboardtheme will change the look and shape of the keyboard buttons, sonow it is easier to write.✧✧ Get this keyboard theme and startusing it instantly! Installation is easy and the steps to activatethe keyboard are very easy!✧★★★ How to install and use KeyboardTheme For HTC★★★• Make sure you have GO Keyboard - Emoji, Wallpaperor New 2018 Keyboard installed on your Android phone or tablet.•Download Keyboard Theme For HTC • Open the new keyboard theme andselect "Set as Active Theme"• Start using the new free keyboardtheme!★ Notice ★ If you do not have GO Keyboard - Emoji, Wallpaperor New 2018 Keyboard installed yet, not to worry, you will beredirected to a download page where you can install the compatiblekeyboard!✧ Do you want more themes for keyboard?✧ Visit ourdeveloper page and download more free keyboard themes!◆ Contact [email protected] if you have any theme requests! We’re alwayslooking to publish amazing new free keyboard themes for Android!Stay connected with us on social media and you will find out whenwe publish new themes for keyboard.